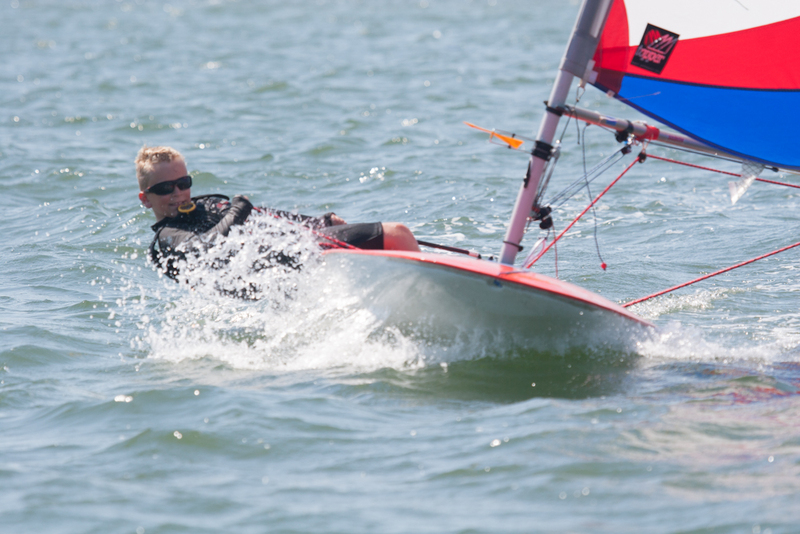 Marconi Sailing Club is fortunate enough to have a number of club owned sailing dinghies. 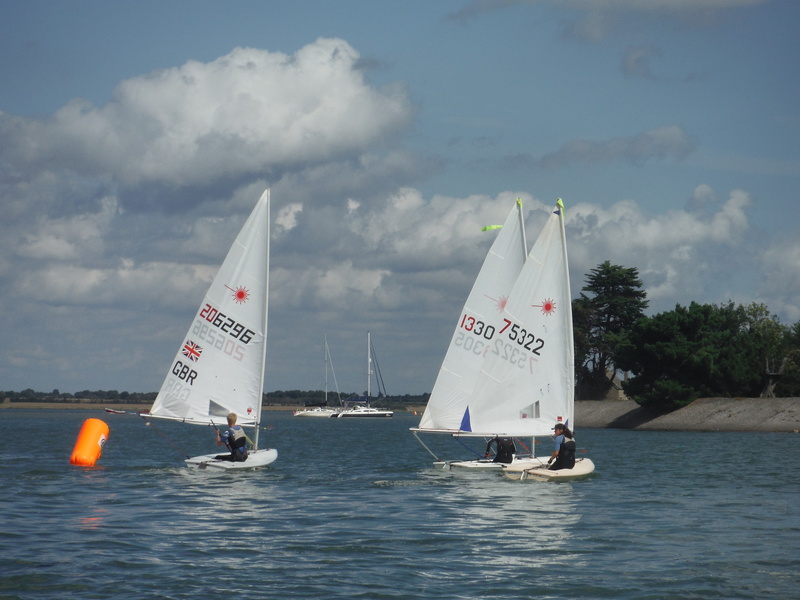 The club dinghies are available for members to use providing there is safety cover afloat for the duration of their use, which makes them ideal to borrow to join in club racing, sail training activities or any of the many organised club sailing activities. Or just to take out for a gentle sail whilst these activities are underway. Currently MSC does not charge for the use of these boats and they are available on a first come first served basis. The exception to this is on sail training days, RYA course days and cadet week, when the boats are reserved for these activities. The club boats are clearly labelled as club boats. The club also owns a Dart/Sprint 15 catamaran which can be found in the cat field. The spars, sails and foils which are not kept with the boats, can be found in the boat equipment store, this store is normally kept locked and you will need the OOD or a club officer to open it for you. If you would like to use one of these boats and you can not find what you are looking for, one of the following people should be able to point you in the direction of someone who can help you. 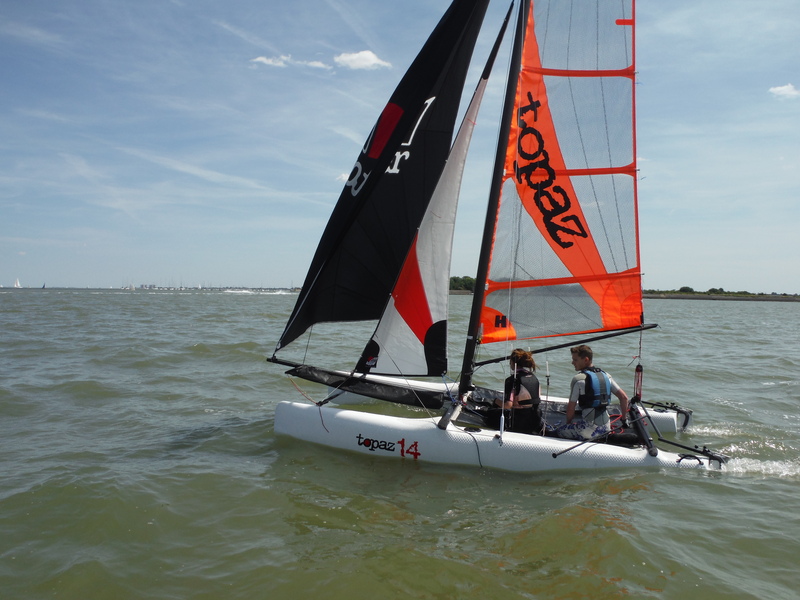 In addition to this the club has access to three Topaz 14 catamarans which are owned by UKCRA (United Kingdom Catamaran Racing Association) which can be borrowed by cadets. 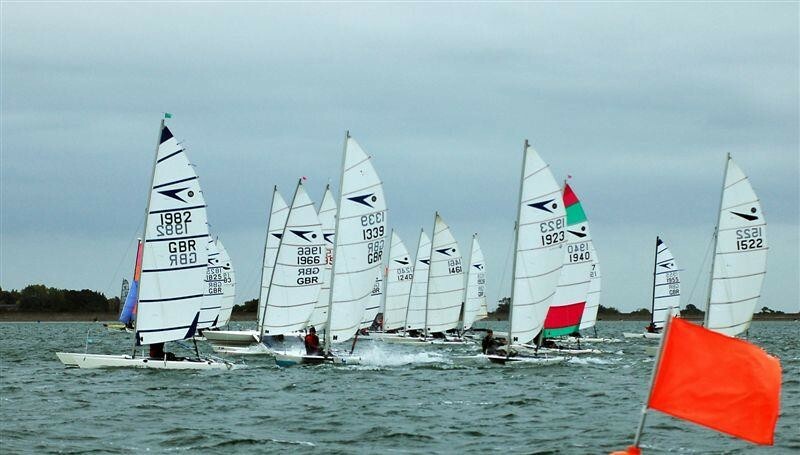 UKCRA Topaz 14s out on the water at Marconi SC, great boats for light weight crews, super fast fun for cadets entering the realm of cat sailing! 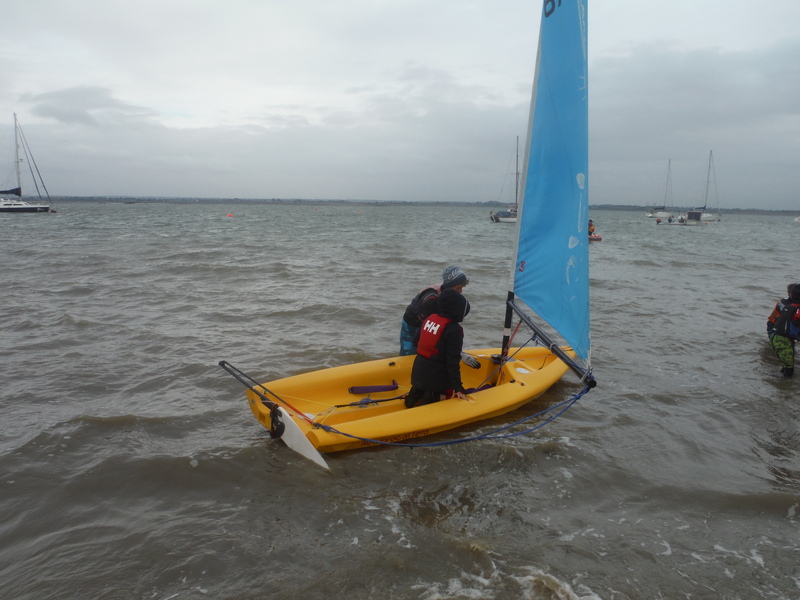 These boats are also available to be borrowed by cadets for club racing, so if you are looking for something different to your usual sail and are up to the task, then why not give one a go. The Pico is a small single handed, tough plastic, fun boat ideal for learning to sail, providing you are reasonably agile and don’t mind get wet. It can also be sailed by two people by adding the optional jib, don’t expect to set any records in this mode though. Great little single handed race boat ideal for children or very small adults, has all the same controls as a Laser but it wont chuck you in as quickly or as often when you get it wrong, also a tough plastic boat that can with stand a few bumps. The perfect boat to begin your racing career in. The wonderful Topper is a great boat which can be bought cheaply its very easy to look after with cheap replacement parts. Light easy to handle ashore, giving young sailors early independence compared to other boats – it really is the top choice for young sailors. The Topper class association (ICTA) is one of the most active in the world offering fantastic opportunities for sailing, with the possibility to sail this boat at every level from club muck around sailing to top flight fleet racing with 200 boats on the start-line. The sky is the limit for the little Topper. Lasers are “the” single handed race boat. An Olympic class boat sailed all over the world by literally hundreds of thousands of sailors. You can probably find more written about sailing this class of boat than any other sailing boat. Our boats are all usually rigged to sail in 4.7 configuration which is the smallest sail and probably the best rig for the boat from a boat handling perspective and certainly from a handicap perspective (its not sailed by sailors who might be competing in the Olympics so the PY returns are more favourable). However if you are feeling ambitious, we do have Radial rigs available (Ladies Olympic Class) and if you are well over six foot and a hulking muscle man or just fancy sailing the boat in ultra slow mode on its side, we even have a Full rig or two (Mens Olympic class). Lasers are great racing boats and can be used with three rigs to suit the physical size of the sailor, the 4.7 rig is our most popular rig it is the smallest and makes the boat manageable for normal sized people, the largest full rig really is only for tall people with plenty of leverage/righting moment. This a super boat, with a powerful rig and asymmetric spinnaker. A comparatively modern design, not quite state of the art though, making it reasonably tough but with a reasonable turn of speed. A great step up from the sit down and chat sailing experienced in a Wayfarer. Offers a really good next step in your sailing journey. A great boat for a day sail and an even better boat to race. Designed to be a competitive and fun club racing boat. Great club racing boat with a real turn of speed when 3 sail reaching. The clubs Dart/Sprint 15 is a super boat, ideal to use to join in the clubs fleet racing activities, we have a growing number of these boats at the club and plenty of help and advice is available from this friendly fleet. This looks like super fun! Fleet of Sprint/Dart 15s starting a race, all looks remarkable civilized! !